**Updated October 2002 after the deaths of Klinta Nader and Klinta Mofeida. ***Updated Jan. 25, 2003 with 2 Mares in foal, one to Nader and the other to Shabakka both due May 2003. ****Updated March 9, 2007. This farm is NO longer in Ireland. See London address update below. Fortunately for me, there is one pure Crabbet breeder in Ireland, Klinta Arabians. This was my first visit to Ireland, and I will certainly not forget the wonderful time I had with Gunilla and Geoff Hamer. Gunilla is a very interesting, lively, humorous and unique individual. Gunilla is Swedish by birth, but has traveled the world, living prior to her move to Ireland in Buch b. Frauenfeld, Switzerland, where she and Geoff kept a pet donkey named Oscar, who was raised by the Hamer’s from age nine days old through to his accidental death at age 21. Oscar was a donkey who thought he was human. Stories about Oscar could fill a small book, like his pension for gin and tonic. Sadly he passed away a few years ago so I did not ‘meet’ him. Gunilla also owns a Skye Terrier by the name of Paddy. Paddy was a champion show dog in his younger days and is her constant companion. Today the Hamers live in Naas, about 25 miles south of Dublin. Naas is in County Kildare, famous for its racing Thoroughbreds. Their property is a green so ‘kelly’ that you have to see it with your own eyes to appreciate the richness of color. When Gunilla was only six years old her father had purchased a three-year-old partbred Arab gelding for her to ride. From then on Gunilla has been riding, and enjoying Arabians. In 1973, Gunilla purchased a three-year-old Anglo-Arab mare Woodstreet Doreas from Mrs. List-Brain in Kent. She was a daughter of the Arabian stallion Shufti (Greatheart x Bint Astreelia) who was later owned by Star Arabians, another of the studs that I visited this past summer. 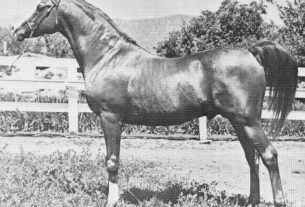 Gunilla bred Doreas several times to either Arabian or Thoroughbred sires. She also bred her to Scindian Overlord, who is a full brother to Sheer Magic (Scindian Magic x Mafari). Gunilla then bought a bay mare, Star Guest, sired by Shufti. She took the mare to Switzerland but did not breed there because of the limited sires available. Gunilla spent 12 years in Switzerland. Unfortunately, Star Guest died in 1988. In 1992 Gunilla and Geoffrey moved to Ireland. They had leased two mares from Daphne and Keith Gilbert of Star Arabian Stud in Lincoln, England. 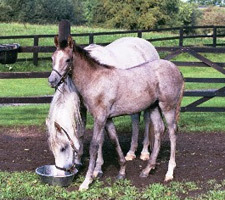 These mares, STAR BINT AURORA (Astar x Aurora) and SAPPHIRE STAR (Akhbar x Aurora) stayed at Star Arabians, along with Gunilla’s Anglo-Arab stallion and the donkey Oscar until the Hamer’s could secure a horse property in 1994. While there, both mares were bred to Indian Reflection (Indian King x Indian Surprise) who stood at Star Arabians. 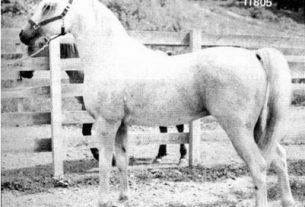 Star Bint Aurora produced the gray mare KLINTA AZMAA. Sapphire Star produced the gray stallion KLINTA NADER, both foaled in 1991. Klinta Nader (Indian Reflection x Sapphire Star by Akhbar), sadly put donwn September 2002 due to colic. 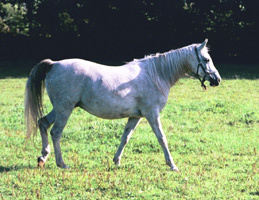 A foal by Nader out of Grey Sparkle was expected May 2003. KLINTA NADER carries multiple crosses to Oran through his sire, Indian Reflection (Indian King by Oran) and his dam, Sapphire Star, who is by the Oran grandson Akhbar, out of the Oran daughter Aurora. He is very Oran-like, except his color, with good substance, short coupling, and correct body. He is also performance licensed. Unfortunately, this almost white stallion has endured three near death operations for colic, which were back to back. This was just a few years ago, and it has limited his use at stud. I viewed a photo of him when he was younger and flying across a show ground, using his excellent ground covering action. Today, only the scar on his belly reveals that ordeal. KLINTA NADER has improved enough that he covered the outside mare CANTATA by Majal (by Indian Magic) x Chantress (by Ludo out of Silver Charm, who is by Indian Magic x Silver Ripple). This 1990 chestnut mare is owned by Alexia Ross and due to foal this summer. STAR SOLITAIRE (Indian Reflection x Sapphire Star) was also purchased from Star Arabians in 1991. Thus began the nucleus of Klinta Arabians mare band. KLINTA NADER (Indian Reflection x Sapphire Star by Akhbar) Sadly put down September 2002 due to colic. 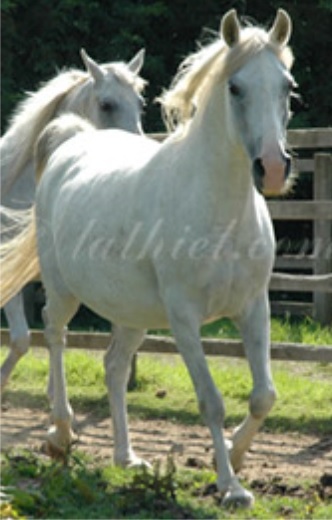 A foal by Nader out of Grey Sparkle is expected in May 2003. The Silver Flame son, Shabakka (x Mona by Naseel). Photo by Caroline Norris. In 1997 Gunilla acquired her stallion SHABAKKA (Silver Flame x Mona by Naseel) who was then aged 21 from Mrs. Jeltsof who was moving and could not bring him. Foaled in 1976, SHABAKKA is a remarkably fit looking stallion at age 24, being a son of British National Champion Silver Flame, (from Mona, a mare sired by the Naseem grandson Naseel). SHABAKKA’s sire and dam’s sire line goes to Naseem. SHABAKKA’s lovely movement is still ever so graceful as he covers the ground in his paddock. He is about 14.3 hands, very smooth overall, with good length of neck and solid bone. He has a pleasing head and overall, there is much of the Skowronek look to him. He is quite like the photo of his sire, Silver Flame in The Crabbet Influence 2000 Millennium Guide, page 56. Gunilla has two younger gray stallions (brothers in blood), both out of Star Solitaire. KLINTA NAZR, by Fanto, has a better hind end but not as pretty head as his half brother, KLINTA BASHIR, by Nefeuret, has the prettier forehand and typier head. 2000 colt Sharif (Shabakka x Star Solitaire), a full sibling was expected May 2003. Gunilla does have stock for sale. The younger stallions are also for sale and at stud. Her primary broodmare, STAR SOLITAIRE, had a SHABAKKA colt, named SHARIF at her side when I visited and he is quite handsome. SHARIF has a pretty head, nice shapely neck with good length, well balanced body, and lots of pretty movement. It will be exciting to see how he matures. His one full sibling, a 1998 filly, KLINTA SAMYRA, is very stylish, has lovely movement, a wonderful temperament and is a very feminine filly. In 1999 Gunilla had two Shabakka colts, one from Star Solitaire and the other from Klinta Azmaa. However they both contracted a bacterial toxin that sadly caused them to die at six months of age. To add insult to misery, Azmaa had not settled for two years prior to this tragedy. As a result, Shabakka had no mature get to view when I visited. However, Gunilla is expecting two Shabakka offspring in 2001 from Klinta Azmaa and Star Solitaire. Although being in Ireland has put Shabakka at a disadvantage for stud, I’d like to see him used on other Crabbet lines. From his two-year-old daughter Samyra, and the colt foal Sharif, I’d say he is capable of siring quality stock. 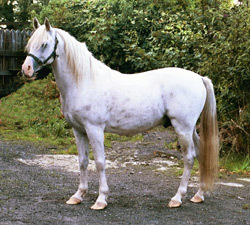 Klinta Nazr, 1995 gray stallion sired by Fanto. 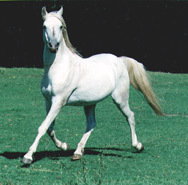 Klinta Samyra, 1998 gray mare sired by Shabakka. (L to R) Klinta Mofeida (by Silvern Idyll) with her dam, Klinta Azmaa (Indian Reflection x Star Bint Aurora). Klinta Mofeida died September 2002. 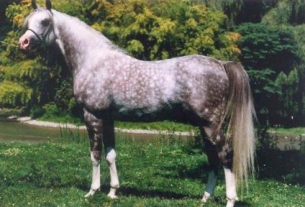 Klinta Mofeida, (Silvern Idyll x Klinta Azmaa) 1995 gray mare. Lost in September 2002 due to colic. 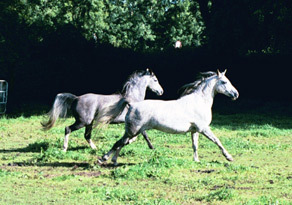 Purchased in 2000 from Maureen de Popp of Milla Lauquen Stud in Norfolk, England, (and delivered while I was visiting) was the 1993 mare, GREY SPARKLE (pictured at top of page as the header/article photo). She is by the American-bred Kildimo (Greggan x Ghadaffa) from Leya of Weatheroak (Indian Blizzard x Cuan Lindra) combining Doyle Egyptian with Crabbet through Indian Magic and Nizzam. She will add rare Crabbet/Blunt lines. One should note that Klinta’s pure Crabbet breeding program does not use Dargee. I mention this as there are some pure Crabbet breeders that do not use Dargee, and there are some that do not use Skowronek. My visit with the Hamer’s was truly a treat. Gunilla and I also shared an exhilarating Saturday watching the Thoroughbreds race at Leopardstown, near Dublin. One country that truly gets totally involved in their horses is Ireland. I do hope my readers have a chance to meet the Hamers and visit the Emerald Isle.